Families and friends - come and be captivated by this lakeshore retreat on Lake Lugano! Boasting a spectacular lakeside setting, this 3 bed townhouse promises a fantastic Lake Lugano escape for families and groups of 8. Ideal for year-round enjoyment, the modernised three-storey house is fully-equipped with all the must-have mod cons for a carefree stay. Practically laid out too, the holiday home’s interior is one of inviting flexibility and restful lakeside appeal. WIFI is to be paid for while booking. Boasting far reaching lake views, the welcoming living room is open plan and perfectly-suited for daytime enjoyment and evening entertaining throughout the year, with direct access leading out to the private lakeside garden. Guests can easily kick off their shoes within the timeless home comfort of its sitting area, with a SAT TV and DVD player on hand for extra amusement. The far reaching lake views also serve as an idyllic backdrop from which to enjoy a memorable feast, with an ambient fireplace on hand to complement an indoor dinner party. The separate kitchen is fully-equipped for carefree holiday stays too, with an oven, kettle, toaster, coffee machine, microwave and oven to hand. Outside, guests will be able to soak up the sunny lake view setting, with an alfresco BBQ meal to the scenic dining terrace. The sleeping accommodation is perfectly suited for flexible getaways with friends and family groups of 8. Couples can enjoy tempting holiday lie-ins to the master double bedroom with lake view terrace and the second double bedroom also with terrace access. A third loft-style bedroom furnished with a double bedroom and a single bed offers a versatile approach to family stays, whilst for added convenience any extra guests can be accommodated to the double sofa bed in the lake view living room. A modern fitted shower room and second bathroom fitted with a bath tub and private laundry facilities complete the internal layout of this inviting family-friendly holiday retreat. Outside, guests can easily soak up the sun and lake views from the 4 sun loungers and lake view dining area, or can just as easily take to the lake, with a refreshing lake swim or boat rental. A private parking space also conveniently features with this gorgeous lake retreat. 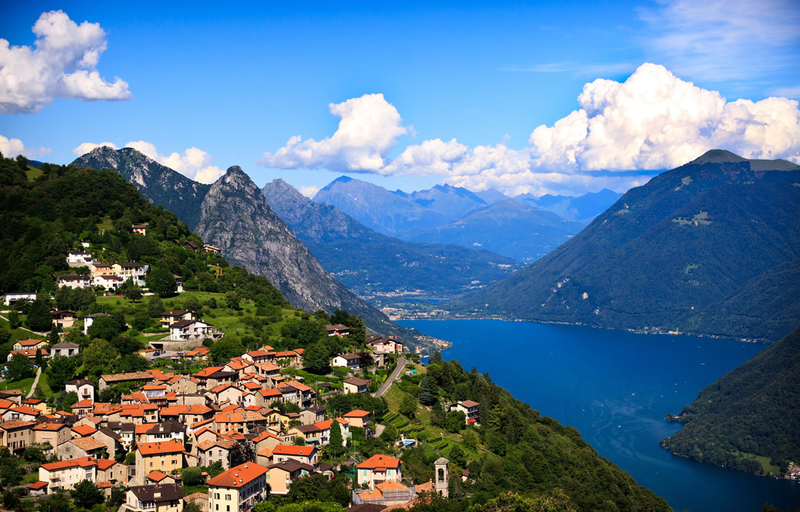 From its authentic lakeside setting in Cima, guests are within easy reach from the selection of authentic Italian restaurants, the luxury San Marco Spa Hotel, the village’s boat rental and water sport opportunities and also the famous FAI Villa Fogazzaro attraction, in nearby Valsolda. Close by, the amenities of the well-serviced resort of Porlezza are just a 2 minute drive away (please note there is no pavement so a car is necessary), as the home is situated along the main road. Here guests can stock up the cupboards with fresh groceries, enjoy a tasty Italian ice cream, savour an authentic meal or take on the family-friendly resort facilities at Porto Letizia. A host of activities can be enjoyed too in the local area, including windsurfing, water sports, horse riding, hiking, cycling, tennis, golf and fishing. Perfectly suited for daytrips, guests are just 21 minutes’ drive from the famous Lake Como resort town of Menaggio; providing the ideal excuse to get out and explore the famous villa attractions and leisure pursuits of this equally beautiful Italian lake. The fashionable appeal and cosmopolitan highlights of Lugano can also be reached just as easily by car, 21 minutes’ drive away. As well as serving as the perfect location for summertime stays, Cima is also situated within easy reach of the Tamaro Adventure Park and the Swiss Italian Alp ski resorts.